Photos by Bryan Stevens A Wood Duck perches on a log in a pond in Erwin, Tennessee. A great many birds spend the spring and summer months in the region. Waterfowl, however, are usually scarce aside from the ubiquitous Canada geese and mallards found at ponds, local park, golf courses and many other locations. Waterfowl aren’t entirely absent, especially when you add the variety of domesticated waterfowl that are often found with the aforementioned geese and ducks. The wood duck is also known as the “summer duck” across much of the southeast, where it is the only wild nesting duck. The small wood duck is a species of waterfowl that can be found, in suitable habitat, during the nesting season. Unlike Canada geese and mallards, which historically never nested in the region until recent decades, the wood duck is supposed to be present during the warmer months of the year. In many parts of their range, wood ducks are known as the “summer duck” since they are the only wild native nesting duck present during the season. Another common name for this species is the Carolina duck, which refers to the southern stronghold of this species of waterfowl. Wood ducks are year-round residents across much of the southeastern United States, especially in suitable habitat such as small lakes, flooded woodlands, swamps and marshes. 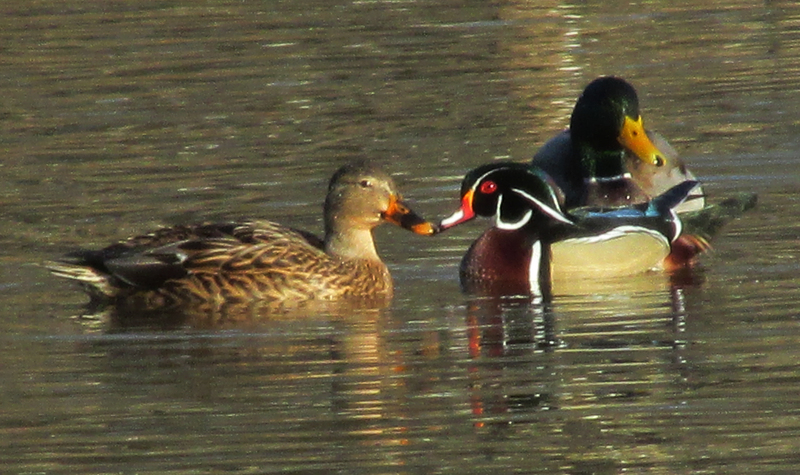 A male Wood Duck is accompanied by two Mallards. 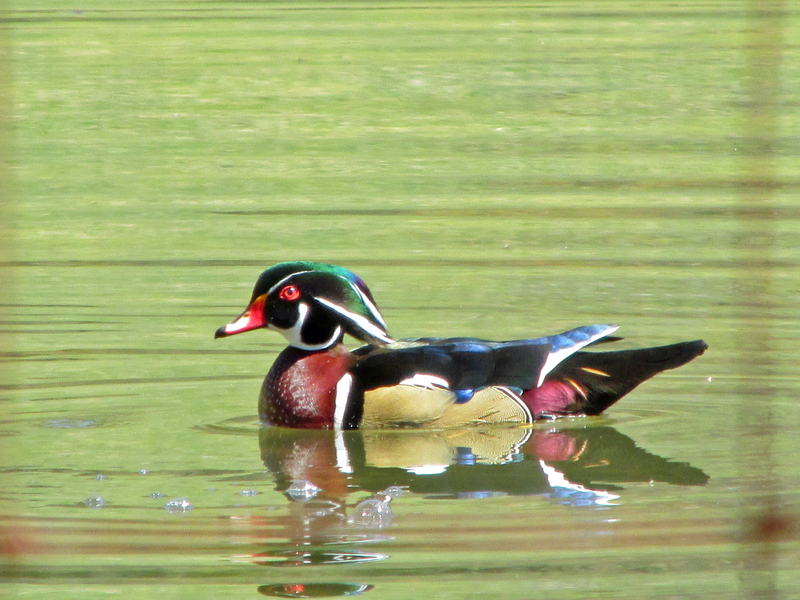 The Wood Duck is considered one of North America’s most colorful ducks. Like a handful of other North American waterfowl, the wood duck is a cavity-nesting bird. These ducks often occupy former nesting cavities created by woodpeckers, but they will also readily accept nesting boxes of suitable dimensions provided by human landlords. Because of their devotion to nesting in cavities, wood ducks have at least something in common with songbirds like Eastern bluebirds, tree swallows and house wrens, as well as larger birds such as American kestrels and Eastern screech-owls. Wood ducks aren’t the only waterfowl that nest in cavities. Buffleheads, hooded mergansers and common goldeneyes are also cavity-nesting ducks. None of those ducks, however, nest in the southeastern United States. 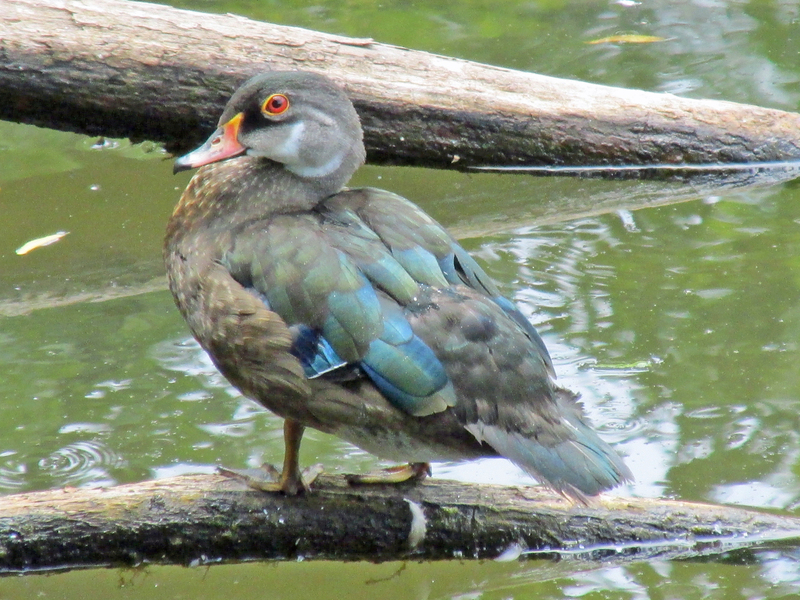 The male Wood Duck, such as this one on a pond in Hampton, Tennessee, is much more colorful than the female of the species. Some wood duck nests can be located far above the ground, which poses a challenge for flightless young. Like most species of waterfowl, young wood ducks are born capable of immediately leaving the nest and being led by their mother to foraging areas. First, however, there’s that giant leap of faith that each of the ducklings must make. Nests are often built over water, so that first jump often ends in a splash-down. Some nests are built over land, but that doesn’t seem an obstacle. The ducklings make that leap without any difficulty. Just like the Abominable Snowmen in the old holiday favorite “Rudolph, The Red-nosed Reindeer,” wood duck babies bounce! Once the ducklings have departed their cozy nesting cavity, their mother will guard them from predators and lead them to prime foraging areas for a period of about two months. 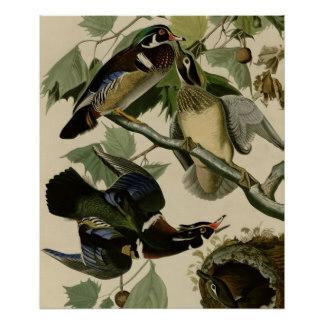 John James Audubon painted Wood Ducks to emphasize their comfort in perching in trees. The wood duck belongs to the genus Aix. The only other species in the genus — the Mandarin duck —is native to East Asia. The two are classified as “perching ducks” by biologists. The males of both these species are among the most ornate ducks in the world. 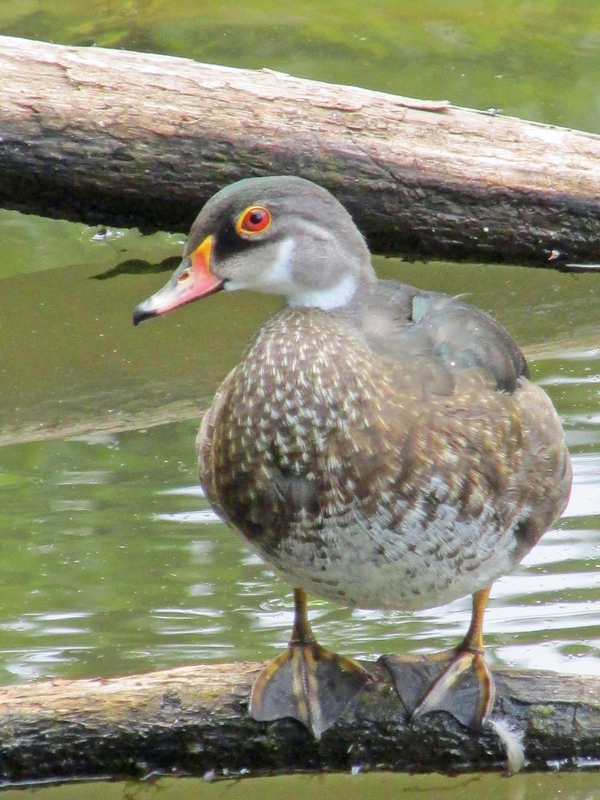 The male wood duck has red eyes and a dark-tipped red bill. The colors in a male’s plumage includes glossy, iridescent greens, purples and browns in dramatic patterns. The male also has a distinctive head crest. 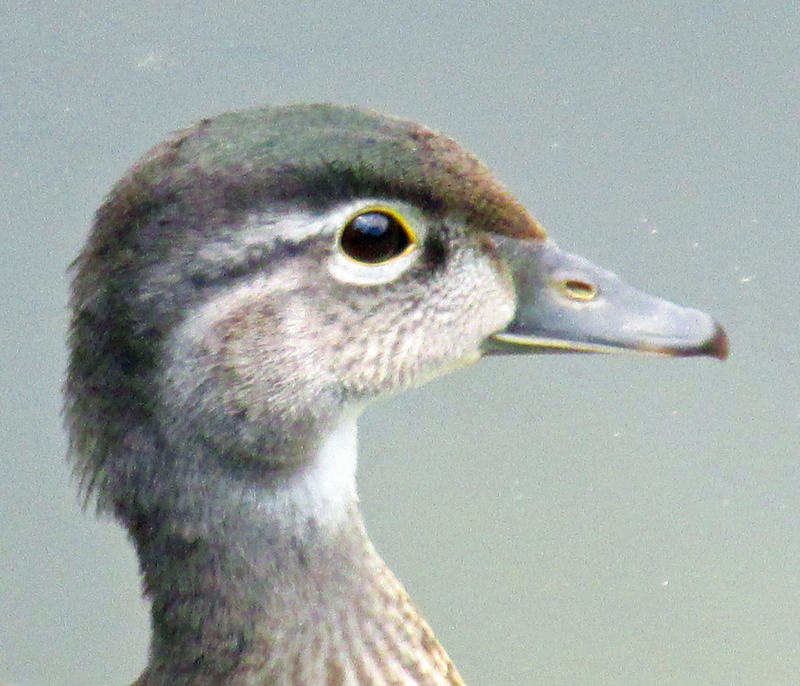 Female wood ducks also have crests, but their plumage is overall gray and brown with a teardrop-shaped white patch around the eyes, as well as a white chin and throat. 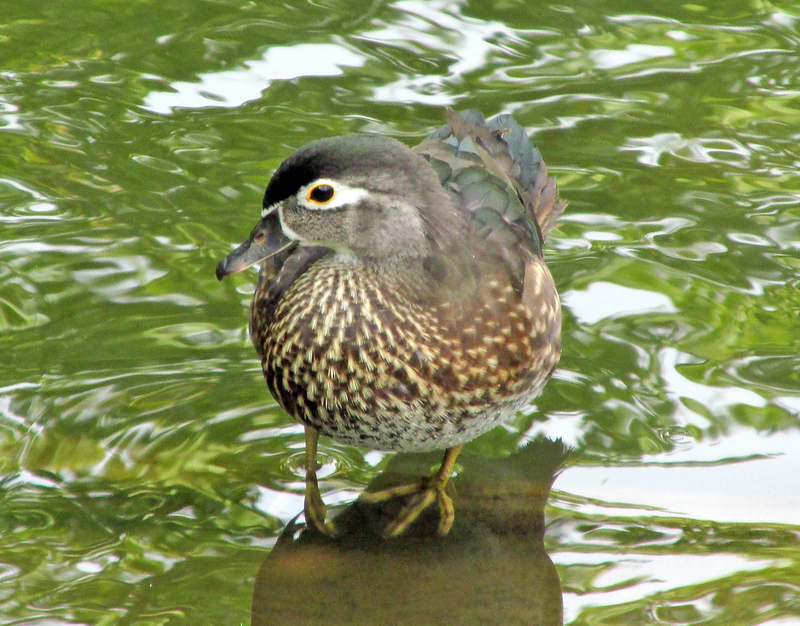 A young Wood Duck perches by a pond’s edge in a small-town park. The majority of a wood duck’s diet consists of vegetable matter. In autumn, I’ve observed these ducks foraging with enthusiasm for acorns. 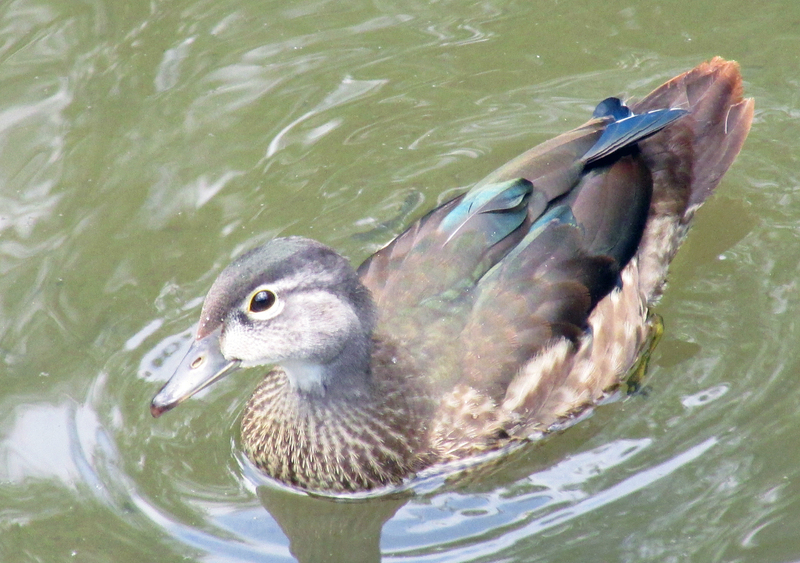 The wood duck, and ducklings in particular, also feed on some insects and other small invertebrates. In his book, “Birds of Lake, Pond and Marsh,” author John Eastman noted that the wood duck was the most abundant of North American ducks during the 19th century. In the late 19th century, pressures from hunting and habitat destruction combined to dramatically lower the numbers of this exclusively North American duck. Eastman noted that the Federal Migratory Bird Treaty Act of 1918 is largely credited with saving the wood duck from possible extinction. 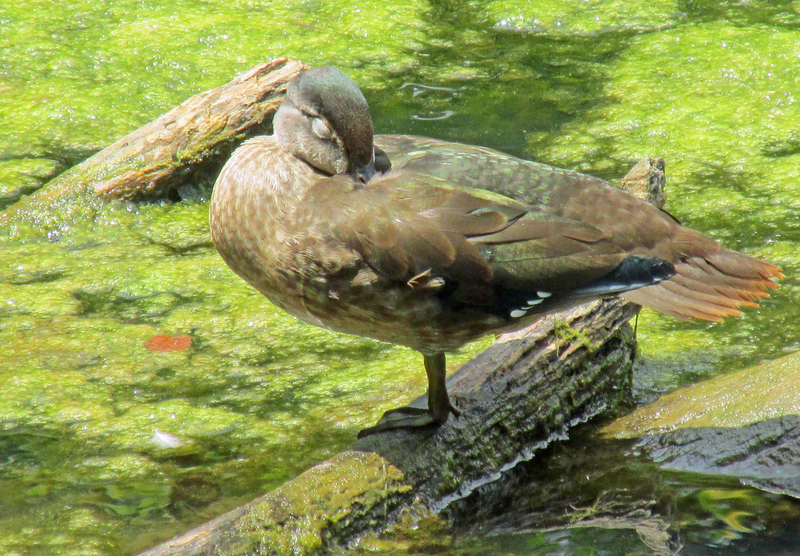 A napping Wood Duck perches on one leg upon a submerged log. From 1918 to 1941, it was illegal to hunt wood ducks. Thanks to this temporary hunting ban and other conservation measures, the wood duck population recovered in dramatic fashion. Recent surveys all point to a species on the rebound with numbers of wood ducks rising for the past several decades. The creek and the fish pond at my home have proven dependable magnets over the years for attracting visiting wood ducks. Most wood ducks in the southeastern United States do not migrate. Those that live farther north during the summer will migrate to areas as far south as Mexico in the fall. 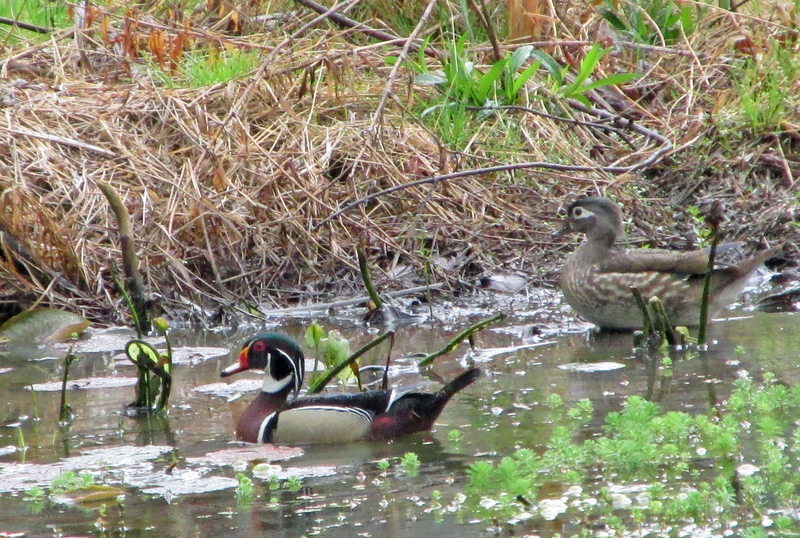 We’re fortunate to reside in a region where wood ducks are year-round resident waterfowl. A Wood Duck takes a late summer swim. 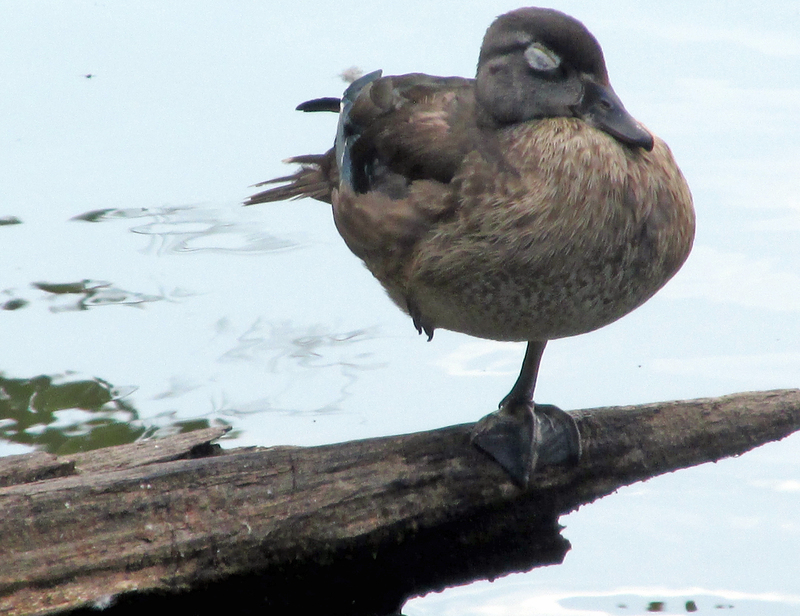 Wood Ducks often have a favorite log where they rest and relax when not foraging for food. 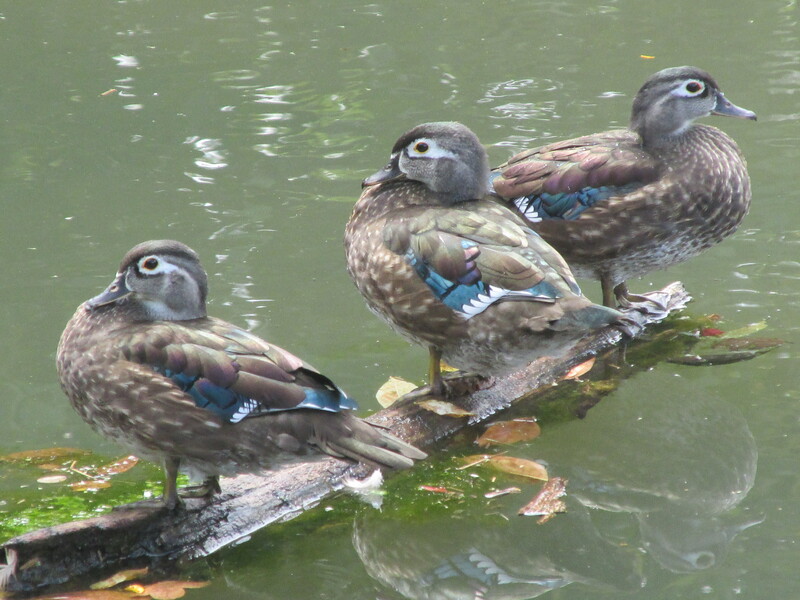 A trio of Wood Ducks in their summer plumage. A male and female Wood Duck makes a stop at a pond in Hampton, Tennessee, during spring migration. The Wood Duck, a favorite species of waterfowl for many people, is also known as the “Summer Duck” throughout much of its range. Wood Ducks molt their feathers during the summer months, giving them a less gaudy appearance for a brief time. 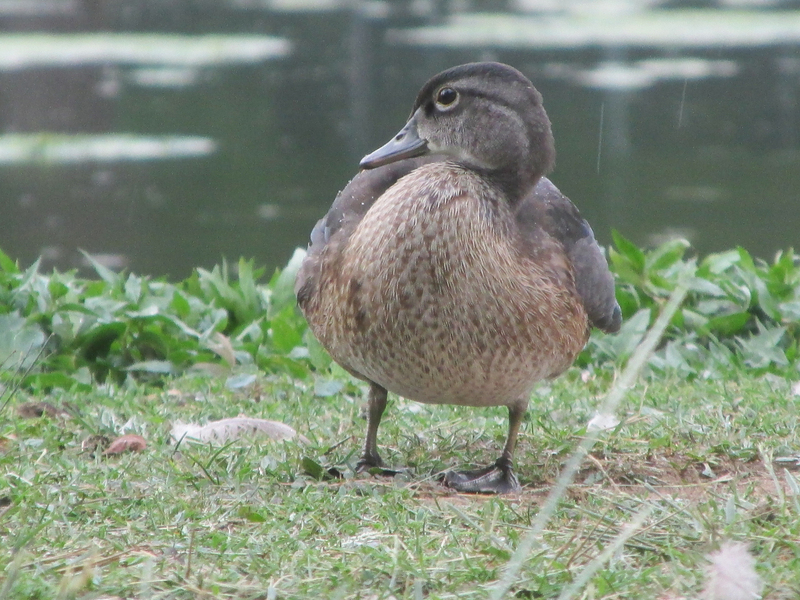 Young Wood Ducks will slowly acquire their adult plumage as summer advances to fall and winter. 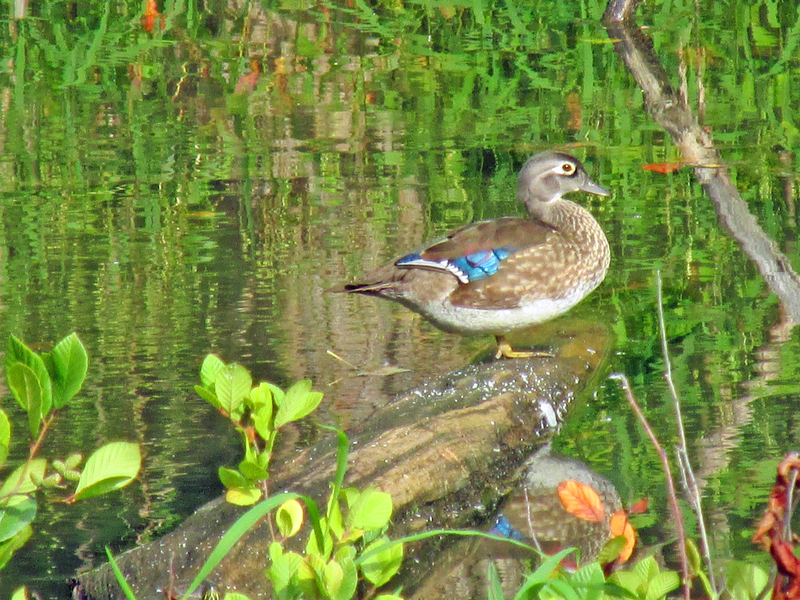 This entry was posted in Birding, Birds, Wood Duck, Wood Ducks and tagged Birding, birds, Bristol Herald Courier, Carter County Compass, Elizabethton Star, Erwin Record, Feathered Friends, Mandarin Duck, McDowell News, Our Fine Feathered Friends, The Erwin Record, Wood Duck on August 16, 2015 by Bryan Stevens.